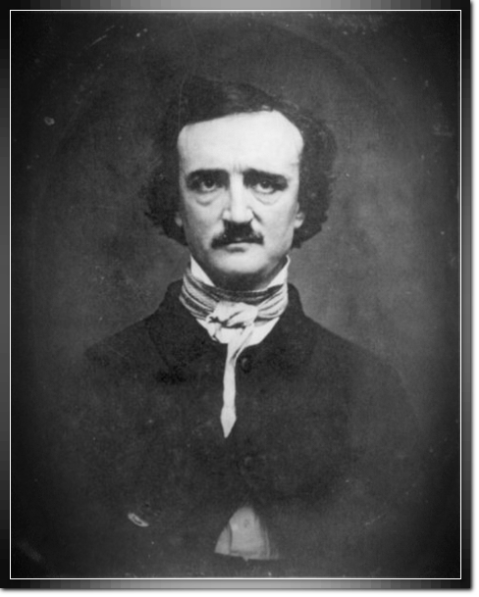 Acknowledged today as one of the most brilliant and original American writers and the father of the modern short story, Poe's world of the beautiful and grotesque, the real and the fantastic, is as powerful today as when it was conceived. He was born Edgar Poe in Boston on January 19, 1809. He was orphaned at two and taken in by Mr. & Mrs. John Allan, who gave him his middle name. Later he spent a turbulant year at the University of Virginia studying Latin, Greek, Italian and Spanish -- and running up many thousands of dollars in gambling debts. Poe entered West Point in 1830 and was expelled a year later. He drifted from New York to Baltimore, then, in 1831, sold five stories to the Philadelphia Saturday Courier. In 1836 he married his 13-year-old cousin. Virginia Clemm. He worked briefly for several literary magazines and wrote the stories and poems that became his literary oeuvre. Virginia's death in 1847 left him crushed by anguish and remorse. Poe died in 1849. He was forty.